The above is a photo of Harvard professor, self-styled ‘consumer activist’ and Massachusetts Democrat Senate Candidate Elizabeth Warren in her secret minority Identity as Chief Spreading Bull.True to form, she’s dressed in the war bonnet of a Lakota rather than the tribe she *cough* claims to belong to, but then that’s part of the fun. 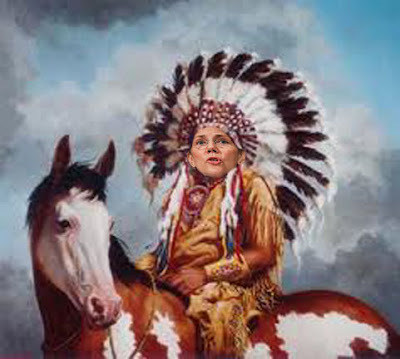 Oddly enough, no one ever asked Warren for proof until recently, and the best that our friend Minni-blah-blah was able to provide was an 1884 genealogical document that might prove that her great, great great grandmother was Cherokee. As the genealogist who found it said ‘This needs more research’. If this document is accurate, that would make Elizabeth Warren all of 1/32nd Cherokee Indian. Based on that criteria, President Obama is an Arab Muslim and I’m the lost heir to the throne of Lithuania. Odd that many Democrats are seem unwilling to disavow racial ‘classifications’ that have more than an aroma of the Nazi’s old Racial Purity Laws. But then, oddly enough, President Obama’s new campaign slogan has a odor redolent of the same place and time. Just a coincidence, I’m sure. This week, RightTruth and The Pirate’s Cove took advantage of my generous offer of link whorage and earned honorable mention status with some killer pieces. The Political Commentator – Must see video: Obama’s “Julia”, Julia’s alter-ego Julia/Julian and campaign incompetence! The Mellow Jihadi – Gimme a Break: Occupy Marines, Really? GrEaT sAtAn”S gIrLfRiEnD – Happy VE Day!! Yid With Lid – al Qaeda Releases Video of My Political Science Mentor Held Since August submitted by VA Right! The Council Forum: What Should Romney Do To Win In November?